At the Bar/Bat Mitzvah Discovery Club we will prepare your son or daughter for their special day with an experience they will love and cherish. Together with Rabbi Mendy & Morah Bluma our students study the meaning of a Bar or Bat Mitzvah, what adult responsibility entails and important decision making that comes along with being an adult. Our students will also study the "13 principles of the Jewish faith" based on the teachings of the Rambam - Maimonides. Our weekly BMC meetings cover ‘tween topics and are filled with activities that guide girls into adulthood with grace, G-d and giggles. 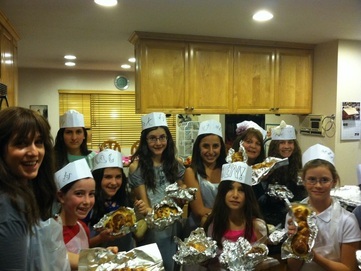 Bat Mitzvah Club conveys what being a Bat Mitzvah really is — in a fresh and fun way! The BMC program consists of weekly interactive classes, trips and exciting Mitzvah Projects which cover key topics in Judaism. The program serves to foster Jewish pride through knowledge in these young boys as they prepare to take their place as tomorrow’s Jewish men. Important: In order to be eligible for a bar or bat mitzvah at Chabad the child must be Jewish. Our accepted definition of "Jewish" means: Mother born of a Jewish mother or can show certification of a Kosher orthodox conversion.